Origami is the art of folding paper into shapes, representing objects and animals and even sometimes people and landscapes. 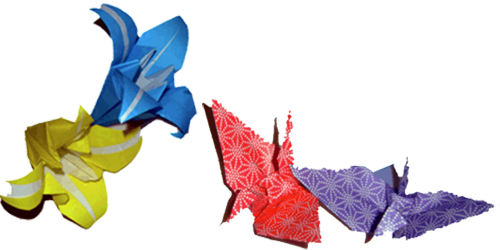 The literal translation of origami is folding (“oru”) paper (“kami”). The origins of this ancient technique are still under debate (due to the temporary nature of paper), but are thought to have originated in China around the time of the invention of paper (100 A.D.). Japanese monks brought origami techniques to Japan in the 6th century and now the art is commonly considered a Japanese tradition. Today, creative paper folders continue to experiment with innovative methods constructing complex shapes, introducing non-traditional methods and materials. Origami is an artistic form that goes beyond just a fun exercise, and has evolved into a practice that deals with materiality, geometry, and math. In addition to the rigorous analytical approach to origami, paper folding also has deep roots in culture. According to Japanese lore, if a man and woman fold 1000 papers before their wedding day, they will sustain a happy marriage. This is known as sembazuru. Capture culture in a fold! Step 1: Now that you have a better understanding of the process, begin your own folded project. Using what you have gained in activity 1, pick a basic shape that you can create through your own innovation. 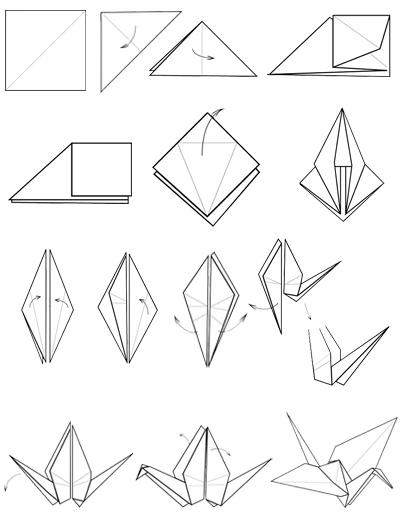 Note: It does not have to start with the original origami shape; it may already exist. Step 2: You may either fold until you have found a step-by-step process that produces the desired shape, or you may systematically solve the process by analysis and design before you begin folding. Step 3: Once completed, replicate your process and create one more shape. Step 4: Develop a set of instructions for others to create your shape. It can be in any medium: animation or 2D sequential drawings. Activity 2 – Explore and Experiment With Paper Folding! Challenge yourself with shapes from the resources listed. Create several themed or engineered structures. Try different scales of material and pieces of paper. Have fun folding! Activity 3 – Observe...And Fold! Find a beginner level folded shape from one of the following instructional websites. Start with a piece of white paper and follow the instructions given. Make sure to pay attention to the folds and creases you are making. Once completed, color all the open faces with a permanent marker or color pencil. Draw over the pleats and folds with dotted lines. Consider the following: Is there symmetry? How do the color shapes relate to one another on the white page? Are there patterns of how folding can create form? What does Origami translate to? From where did origami originate? When is origami thought to have begun?